still catching up on things, but hopefully this will be the last random post before a proper review post. i was out of town for work this past week, and pretty much the only good thing about it is that i came across these awesome nintendo t-shirts at a random mall in a store called hot topic. apparently these officially-licensed shirts have been out for a while and are sold at a lot of other places (at least online), but i must have been completely out of the loop b/c if i’d known i’d def. have bought some before now. i don’t recall seeing anything like the number of designs at the the nintendo world store in NY so maybe they haven’t been out for too long (the girl in the store said they’d been out for at least a couple of years), or maybe it’s just been longer than i thought since i was last there. anyway, after i snapped up a couple of shirts at that store, i immediately checked their online store for sizes of shirts i’d kind of liked but they hadn’t had. but then i found some other places that also sell nintendo shirts online, namely this store on ebay called zanybunny and a site called myteespot.com. the three places carry slightly different stuff and i spent way too much time looking through them all, but i ended up going with myteespot b/c they had the most designs (including patches, hoodies, buttons, caps, keychains, wristbands, and more) and free shipping for orders over $50. as a nintendo fanboy i’m totally psyched to have the shirts, but as a somewhat socialized human being i haven’t quite decided how willing i am to expose my geekiness in public. 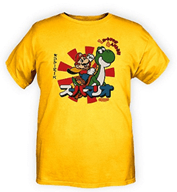 in the right situation a nintendo shirt could make a great conversation starter … but you might want to think twice about wearing them to certain places. somehow i think they’d be less appreciated at, oh, your workplace, your 10-year high school reunion, the gym, and pretty much anywhere you’re trying to attract a mate. 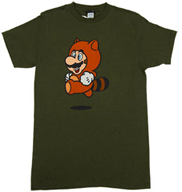 😉 otherwise, it’s mario wearin’ the freakin’ tanooki suit FTW!!!1! behind on my game playing, mostly b/c of work. here’s another worthwhile link for ya, though. in my last post i mentioned that the same games tend to show up on “top games of all time” lists over and over again. this seems to be especially true of the IGN readers’ poll; at least, that was my first impression when i read through this year’s list. i’m a sucker for a good list, and after the first devouring of this one i’ve taken a closer look and realized it has a bit more variation than i’d originally thought, although still not as much as when compared to the editors’ poll. but i did notice the same thing that i had noticed in the previous readers’ polls: namely, that the readers’ choice list tends to favor recent releases, but as time passes the truly great remain on the list (i.e. the classically great, instead of the faddy favorites). 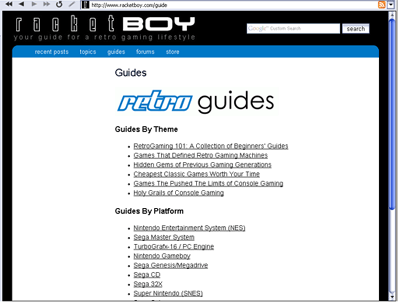 the lists also seem to favor certain genres and pretty much completely ignore classic games (e.g. anything NES era and before), which of course leaves a huge gap. nevertheless, some interesting things about this year’s list are that all three of the metroid prime games made the list (along with the three most recent 2D games). all four of the console metal gear solid games are also included. but the zelda series easily beats out any other franchise for the most appearances on the list with a whopping 8 by my reckoning, and (surprise, surprise) claims the number one spot for the second time in a row with ocarina of time. geek that i am, i’ve been keeping a copy of IGN’s top 100 readers’ and editors’ lists ever since they began, way back in 2003. they have a great system in which they alternate the readers’ lists with the editors’ lists each year so that each occurs only once every other year, allowing for more variation. and geek that i am i like to compare the lists to each other, comparing the readers’ choices to the editors’, and the progression from year to year. you can join in on the fun by checking out this compilation i made of the IGN’s editors’ and readers’ top 100 games of all time lists. yeah! useless lists! times 6! i started a loooooong game, so i may not have a review for a couple more weeks, but i’ve been meaning to post about this quick fix if you’re having problems connecting your wii with your wireless network that i didn’t find until several months after i got my wii. basically the problem was i have a comcast home network set up and my laptops (mac and PC) had no problem connecting to the wireless (128-bit WEP security), but my wii was never able to connect using the exact same WEP key. the first time i looked on nintendo’s website for a solution they didn’t have any info on the problem, but when i checked again a couple of months later they’d updated the info for my router (netgear CG814WG). basically all i had to do was change the wireless channel to 1 and then everything worked perfectly. to find that setting all you have to do is connect your computer to your network, point your browser to http://192.168.0.1, and then click on “wireless settings” and change the channel to 1. apparently channel 11 may also work for you. then, if you haven’t already, of course you should enter your WEP key (listed on that same page) into your wii and hopefully you should be all set. so hopefully this will be helpful to anyone who has the same problem and hasn’t found a fix and is doing a google search for the solution! one of the main complaints about the wii is that the current library of must-have titles is fairly small, which was one of the gamecube’s biggest problems. the wii has only been out for a little less than a year, but just when i was starting to get worried more developers have announced wii titles, hoping to capitalize on the wii’s phenomenal success. from a business standpoint it makes sense for them, since wii titles will be significantly quicker and easier to make. in any case hopefully we should see some big changes soon. 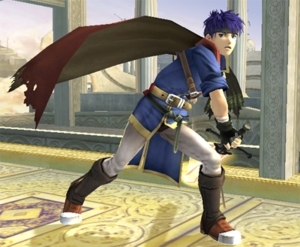 regardless, this holiday season isn’t looking too shabby, which for the wii includes the release of fire emblem: radiant dawn, the sequel to fire emblem: path of radiance. there was a minor ruckus on IGN’s fire emblem message boards due to bozon’s egregiously rushed (and in my opinion completely unprofessional) review in which he dismisses the game on the grounds of it being a sequel and provides little to no detail about the game itself. in fact, the conspicuous lack of detail has led more than one reader to wonder whether he even played the game, which for such a respected site is just, in a word, pathetic. i am in no way exaggerating when i say it’s one of the shabbiest reviews i’ve ever read on a professional site. hopefully this doesn’t indicate IGN is jumping the shark, but this has been a big blow to their credibility and has lead me to a conveniently apt nickname for bozon, provided by simply removing the last letter of his name. i’ve been getting more and more disappointed in IGN’s reviews which seem to confuse aesthetic preferences in game design with unique and quality game experiences. the radiant dawn review reflects this, and casamassina in particular keeps complaining about games like zelda not featuring voice acting when the creators have made it clear that it’s an aesthetic choice. time will tell how loyal i stay to IGN, but in the meantime i’ve already started spending more time at other sites like 1up.com and i’ve always enjoyed the reviews at gonintendo.com. i also find myself often agreeing with the reviewers at nintendo power, so i may spend more time reading that as well. well, that was a longer editorial than i’d meant it to be. i’ll split off what i was actually going to write about to make archiving more convenient. … molasseslike sales for a product that must succeed if Sony is to retain its global leadership in electronics and entertainment. According to the NPD Group, a market research firm, Sony sold just 82,000 PlayStation 3’s in the United States last month, fewer than half the number of Xbox 360’s sold by Microsoft (174,000) and less than a quarter of the number of Wii consoles sold by Nintendo (360,000). how do you say “dream job”? i’ve been mostly focusing this blog on reviews thus far, but to while away the time between reviews (and in spite of the fact i just finished a game) i’ve decided to also post about general topics of video game interest. since great sites like gonintendo.com and ign.com already cover so much, including news and upcoming releases, instead i’ll be focusing on the occasional item that i think is worth archiving for my personal reference and that hopefully you’ll find entertaining as well. so as you prob. already know, shigeru miyamoto (one of my personal idols and i’m sure many others’ and creator of, among other things, the mario and zelda series) gave the keynote at the game developers conference (GDC) 2007. if you haven’t seen it already, ign has a summary here and videos here. there were two related items that i found interesting. first, apparently miyamoto also gave the keynote at the GDC in 1999. ign has a full transcript of that here. interesting to compare the two. second, i came across a much more interesting than usual interview of miyamoto at the 2007 GDC on mtv.com. unfortunately, it looks like the original article is gone, but here’s a copy courtesy of google’s cache. 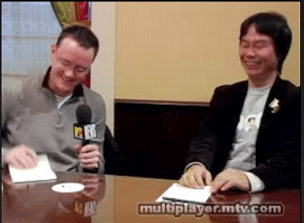 the video accompanying the article is also quite entertaining, and in it we see a lot of bill trinen, who apparently has been miyamoto’s american translator for the past 7 years or so. i’m always struck by how well translators do in real time and had thought the translator had done a great job w/ the translation of miyamoto’s GDC 2007 speech. so it was quite interesting to see miyamoto and trinen side by side. gameinformer.com also ran a really interesting interview with him a few years ago that talks about how he started translating for miyamoto and about his career doing localization for nintendo of america. talk about dream jobs. anyway i think it’s definitely worth reading. geozeldadude says: rock on.